‘Body Maps’ is an early series of work, in which the artist combines representation of the landscape with the female body to explore issues of ownership, exploitation and colonisation. 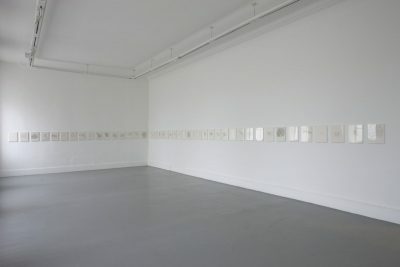 Map-making has been an important motif in Kathy Prendergast’s work from the outset of her career. By applying map-making techniques to the figure the artist brings together two themes that have been linked for centuries – the landscape and the female body. However, mapping projects are also associated with colonisation. The landscape recorded in this way ceases to be landscape and becomes a territory to be colonised. This work reflects Prendergast’s ongoing commitment to exploring other conventions for representing three-dimensional qualities. In this instance there is an almost surreal imagination at work in the presentation of the female body through the pages of an atlas.